Dry, dead looking grass is everywhere! This past winter has waged a vicious war on our lawns and landscapes. 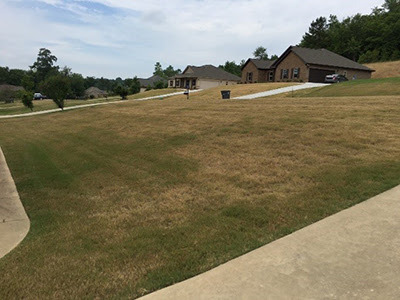 The dry weather, combined with unusually high temperatures and watering restrictions, have given our lawns a poor start to the summer season. Many lawns, like the one pictured above, are beyond immediate rescue provided by basic watering. Also, the beginning of Summer starts today, (in combination with an unusually hot Spring) and Colorado temperatures continue to break records. If the full amount of your taxes has already been paid, please disregard this message. This is a reminder that the 2nd half property tax due date is June 15th. Your online payment options are on our website at www.arapahoegov.com/departments/tr. Payments mailed to our office must be postmarked on or before June 15th. You can verify whether or not your taxes have been paid, as well as view and/or print your tax statement by visiting our website at www.arapahoegov.com/departments/tr. -Scroll down to the Property Tax Detail section, and look at the last column (Full Payment/Balance Due Amounts), and the Total Due row to see what is owed. Your second half tax amount is identified on the right hand side of the 2nd Half Coupon. Other information pertaining to your taxes and upcoming changes are also available via the link Printable Tax Statement: Other Pages. Thank you for using our online service. Please contact us by phone at 303-795-4550, or by e-mail at treasurer@arapahoegov.com, if you have any questions or need assistance.